ANZAC Day is an important day, lodged deep in the Australian psyche. It was a day where I don't do much beyond making ANZAC biscuits (cookies). My brothers and the other boy cousins went off to the dawn services with fathers and our grandfather and then go drink beer at the RSL (Retired Serviceman's League) afterward. It means a lot, not just to remember those who died for their country and ideals and those who made it home. For me personally, it illustrates the utter horrific waste of life. My grandfather survived WWII, which he never talked about. We never even knew that he'd been to San Diego until he met my then-soon-to-be-husband. 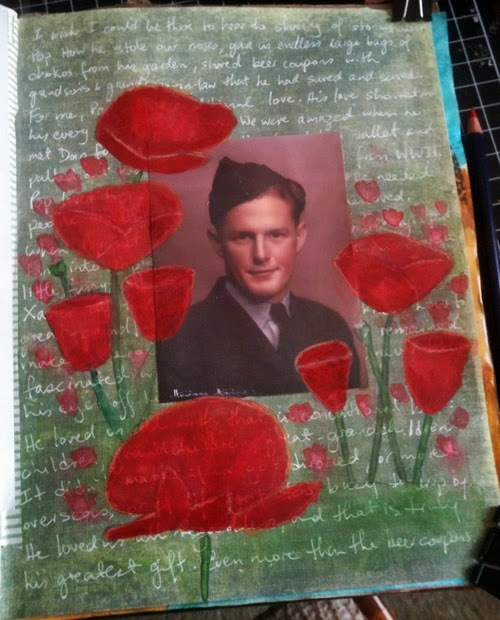 I couldn't get home for his funeral, but I wrote something to be read and then I turned it into an art journal page.